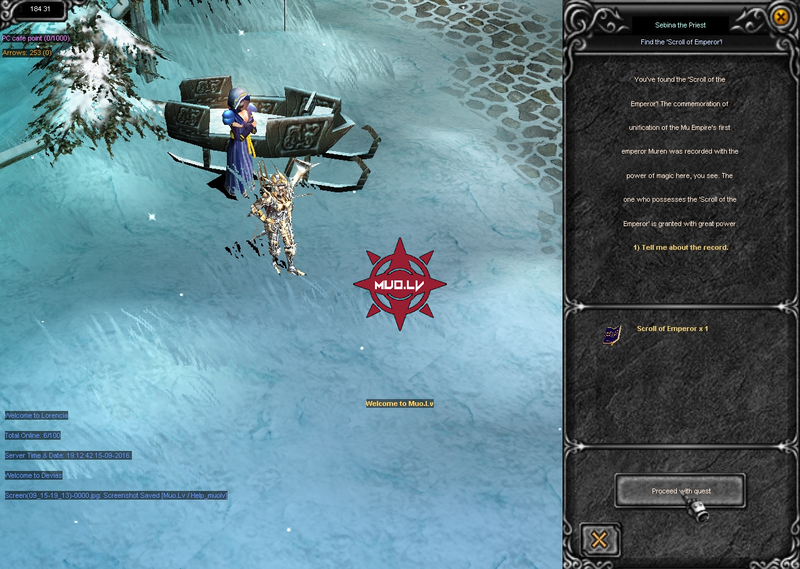 Once you have reached level 150, go to the Priestess Sebina in Devias to hear the story of the 'Scroll of Emperor'. You will need to offer a token of 1 Million Zen for the Priestess's story. The 'Scroll of Emperor', which tells of Muren, the first emperor to unify MU, is said to have been seen around the Lost Tower, Atlans, and the Dungeon. Legends have been told of the Scroll being enveloped by a great power and whoever reads from the scroll shall be able to wield this power. Once you find the Scroll, go to the Priestess who will aid you in unlocking the Scroll's power. As you feel the Scroll's power flowing through you, the Priestess relates the story of the peace brought about by Emperor Muren's reign. A historical record of the first emperor Muren contains the commemoration of peace through the triumph of Muren over all warlords, and by doing so, unified the continent into the Empire of MU. Muren was one of the three Heroes that ended the chaos brought upon the people by Sekneum's invasion. After the empire was united, people swore loyalty to the emperor. To signify this oath of loyalty the tribes offered three treasures. The 'Broken Sword' was offered by the dark knights as a symbol of their bravery, loyalty and their wish for prosperity. The 'Tear of Elf' was offered by the elves as a token of their vow to strengthen the unity between elves and humans. The 'Soul of Wizard' was offered by the dark wizards as a symbol of their vow to dedicate their power for the peace and freedom of the empire. The Priestess can assist you in furthering this quest if you give her a small token for her troubles worth 2 million Zen. She will then task you to seek one of the three treasures depending on which tribe you hail from. Return the treasure to the priestess to complete this quest. Once you complete this quest you will become either: a Blade Knight, a Soul Master, or a Muse Elf.